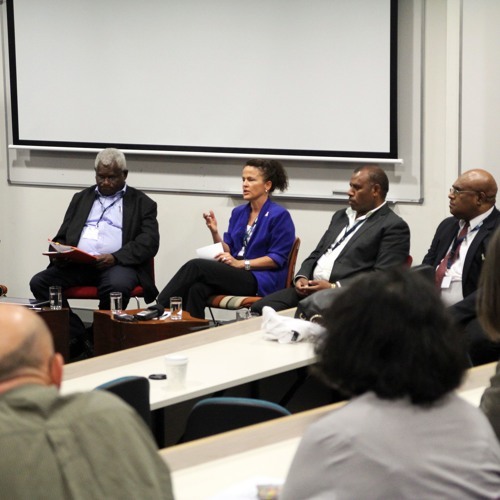 This panel discussion showcased high-profile speakers from Papua New Guinea and Australia. It explored current gender parity issues in Papua New Guinea, how business can work to adopt a diverse workforce and how to expand the opportunities available to both men and women within the changing commercial and social environment of Papua New Guinea. Speakers: - Ms Avia Koisen Principal, Koisen Lawyers - Dr Eric Kwa Secretary/CEO, PNG Constitutional Law Reform Commission - The Honourable Malakai Tabar MP Minister for Higher Education, Research, Science and Technology in PNG Magistrate John Kaumi Mendi District Court Senior Provincial Magistrate - Dr Linda Van Leeuwen Capacity Building Specialist and Manager, Anitua Professor Stephen Howes Director of the Development Policy Centre (Chair) This panel discussion was part of the ANZ | PNG Gender Parity Symposium, held from 13- 15 October in Canberra, Brisbane and Sydney.